What better way to bring some charming atmosphere with a rustic appeal into your retail space than with this set of 3 Cedar Whiskey Barrel Planters. 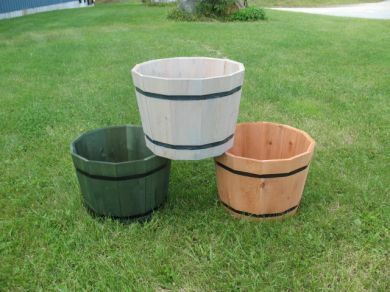 Made of sturdy and rot resistant northern white cedar, these wooden tubs are sure to last a long time. Each barrel is 24-inches in diameter and 14-inches tall, giving you ample room to use for displays, storage containers and more. Fill these wooden store displays full of wrapped candy, nuts or lots of other bulk items you want to place on exhibit. Place these cedar tubs near the exit as excellent impulse purchase displays. Add some rustic appeal into your landscapes, near your outdoor pool or in your home as well. Make sure to order your wooden containers soon!